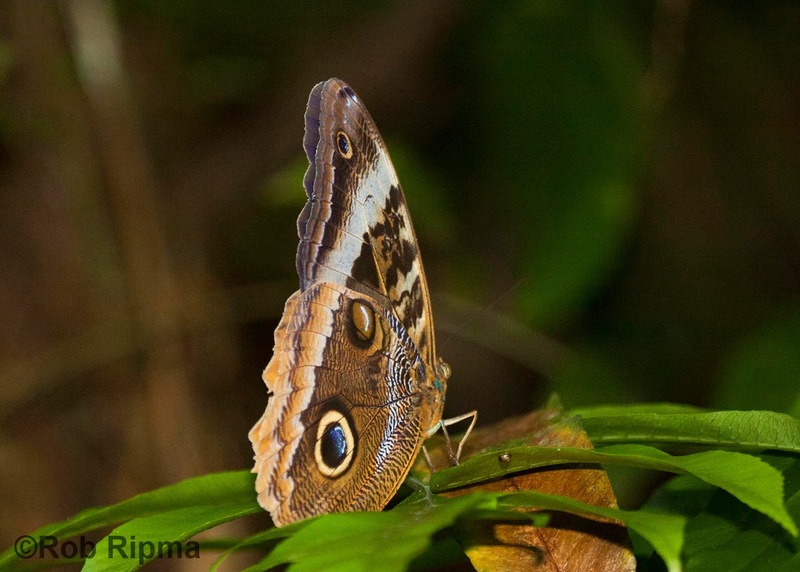 Rob writes: Unfortunately, Greg had to head home on our fifth day of birding in Honduras. He had a little bit of time in the morning, so Elmer took us along some of the Lodge trails that we hadn't covered yet in hopes of finding Greg a couple new birds before he headed to the airport. 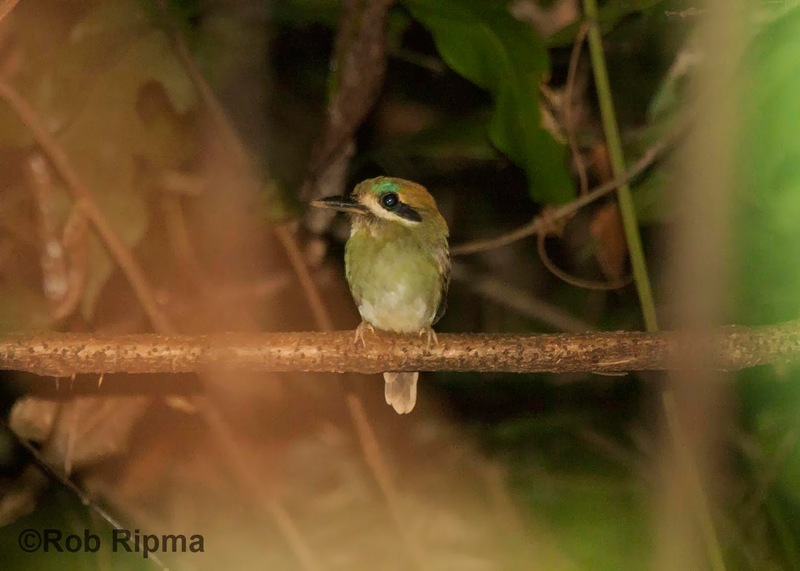 It didn't take long before we found a Tody Motmot which was a lifer for Greg, Brian and I! This Tody Motmot really put on a show. What for some video of this bird coming soon! Also during our morning hike, we got great views of our first Black-throated Trogon of the trip and saw many other awesome birds. After bidding farewell to Greg, our friend James convinced Brian and I that we should do the hike to Unbelievable Falls. We didn't know much about the hike or the falls but did know that there is an easy trail and a hard trail. We decided that we would take the easy trail to the falls and then decide which trail to take back. On the way to the falls, we came across a nice flock of birds. While Elmer and I worked on identifying all of the birds in the flock, Brian focused in on videoing a male Red-capped Manakin. By the time we were ready to continue on with our hike, we were both extremely happy guys - I got the best look of the whole trip Lovely Cotinga and finally saw Green Honeycreepers, and Brian shot some amazing video of the manakin. We didn't find too many more birds during the hike to the falls but it was definitely was worth the hike! Unbelievable Falls is an absolutely incredible site, and I would highly recommend making the trek to the falls. Since the easy trail was in fact fairly easy, we decided to take the hard trail back to the lodge. We had no idea how difficult it would be! The first part of the trail takes you almost straight up hill. The trail can be muddy and slick, and it was really tricky for Brian to try to stay balanced while carrying his huge camera lens. But once we got to the top of the steepest part of the trail, the hiking got easier and the birding really got much better. We stopped to look at a few Red-crowned and Red-throated Ant-Tanagers and quickly realized that we had actually stumbled upon a much larger flock. As a group of Black-faced Grosbeaks moved through the tree tops, we noticed some other species mixed in. The highlights were Tawny-crowned Greenlet, Black-throated Shrike-Tanager and Gray-headed Tanager. Then, just a little ways up the trail, a bird popped up in the open on a low branch. It turned out to be a Scaly-throated Leaftosser! I was extremely surprised when Elmer told us that he hadn't seen some of these species on the lodge property in almost 10 years. It was an exciting hike for all of us! As we neared the end of the hike, I saw a bird quickly move across the path into the woods. It was a Great Tinamou, which was a lifer and a great way to end our hike. Back at the lodge we sat down to celebrate making it through the hike with some local beer, Salva Vida! Here a couple photos of the non bird highlights from the hike. This is a huge owl butterfly. It took us awhile to get one that would sit still for photos but it was worth the effort! I was really happy with the setting that we found this whiptail lizard in. 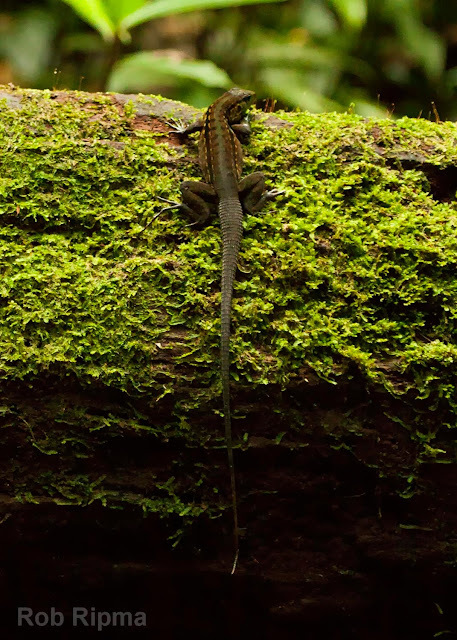 The mossy log was the perfect background and the lizard stayed quite still for us.